This book offers the first comprehensive analysis of warfare ethics in early China as well as its subsequent development. Chinese attitudes toward war are rich and nuanced, ranging across amoral realism, defensive just war, humanitarian intervention, and mournful skepticism. Covering the five major intellectual traditions in the "golden age" of Chinese civilization: Confucian, Daoist, Mohist, Legalist, and Military Strategy schools, the book’s chapters immerse readers in the proper historical contexts, examine the moral concerns in the classical texts on their own terms, reframe those concerns in contemporary ethical idioms, and forge a critical dialogue between the past and the present. The volume develops fresh moral interpretations of classical texts such as The Art of War, Mencius, Xunzi, Mozi, and the Daodejing and discusses famous philosophers such as Han Fei and Wang Yang-ming, representing antithetical schools of thought about warfare. Attention is also given to the military ethics of the People’s Liberation Army, examining its thinking against the backdrop of its own civilizational context. 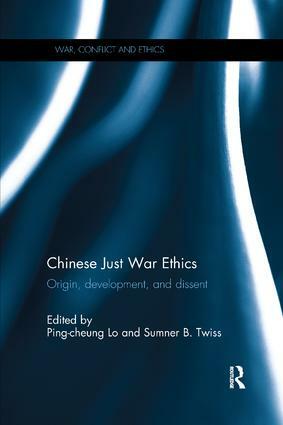 This book will be of much interest to students of just war theory, Chinese politics, ethics, and philosophy, military studies, and International Relations in general. Warfare ethics in Sunzi’s Art of War? Zheng (征) as zheng (正)?